“The US thinks that its oft-repeated ‘sanctions and pressure’ leads to ‘denuclearisation.’ We cannot help laughing at such a foolish idea,” it said. In an interview with Fox News’ Sean Hannity on Friday, US Secretary of State Mike Pompeo said he plans to talk next week with his North Korean counterpart, apparently referring to senior North Korean official Kim Yong Chol. Pompeo did not provide the location and date for the meeting, which will likely be focused on persuading North Korea to take firmer steps toward denuclearisation and setting up a second summit between Trump and Kim Jong Un. The ministry described the lifting of US-led sanctions as corresponding action to the North’s “proactive and good-will measures,” apparently referring to its unilateral suspension of nuclear and intercontinental ballistic missile tests and closure of a nuclear testing ground. However, the North has been playing hardball since the summitry, insisting that sanctions should be lifted before any progress in nuclear talks, which fuelled doubts on whether Kim would ever deal away a nuclear program he may see as his strongest guarantee of survival. He also declared that the North would stop nuclear and long-range missile tests. The North dismantled its nuclear testing ground in May, but didn’t invite experts to observe and verify the event. 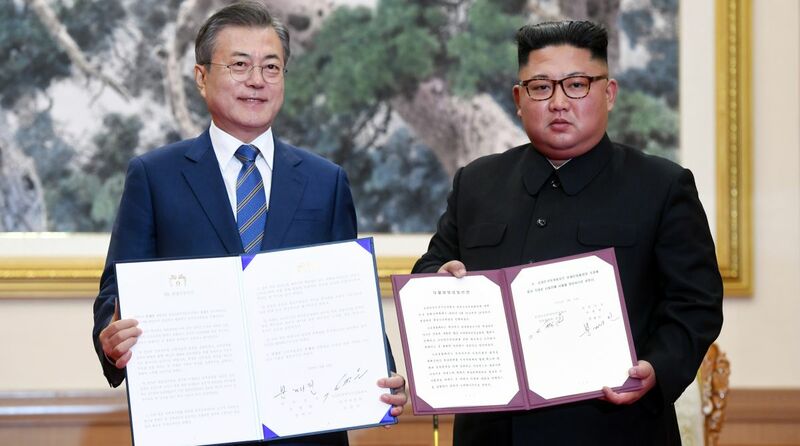 Friday’s statement marked the first time the North said it could potentially resume weapons tests and other development activities since Kim signalled a new state policy in April. A large number of South Korean CEOs accompanied Moon in his September visit to Pyongyang, when he and Kim agreed to normalise operations at a jointly run factory park and resume South Korean visitors’ travel to the North when possible, voicing optimism the international sanctions could end and allow such projects. But South Korea’s enthusiasm for engagement with its rival has also created discomfort in the United States amid growing concerns that the North is dragging its feet with its promise to denuclearise. South Korea last month walked back on a proposal to lift some of its unilateral sanctions against North Korea to create diplomatic space following Trump’s blunt retort that Seoul could “do nothing” without Washington’s approval.